The Weiyuan Structure is the largest surface structure in the Sichuan Basin. However, the abundance of the Dengying Formation gas reservoir in the Weiyuan Structure is low. The height of the gas column is 244 m, but the integrated abundance is only 26.4%. After nearly 40 years of exploration, the Gaoshi1 Well and Moxi8 Well yielded gas flows that marked an important exploration success after the discovery of the Sinian Dengying Formation gas reservoir in the Weiyuan Structure, Sichuan Basin, Lower-Paleozoic in 1964. Combined with research examples of oil and gas migration and gas chimneys around the world, the authors used comprehensive geological-geophysical-geochemical research methods to provide a reasonable explanation of the low abundance of the gas reservoir in the Weiyuan Structure based on the surface and subsurface data. The latest research results show that (1) currently, the Weiyuan Structure is the apex of the Dengying Formation in the Mid-Sichuan Basin. The Guang’an, Longnüsi, Gaoshiti-Moxi, and Weiyuan structures are a series of traps in the Dengying Formation with gradual uplifting spill and closure points during the regional uplift of the Himalayan period. The natural gas of the Dengying Formation accumulated in different ways over a wide range and long distance in the Sichuan Basin. (2) At approximately 40 Ma, the Weiyuan area started to uplift and form the present structure, and it is the only outcropped area with the Triassic Jialingjiang Formation and Leikoupo Formation in the surface of the Sichuan Basin (except the steep structural belt in East Sichuan). Caused by the uplift and denudation, the core of the Weiyuan Structure has formed an escaping “skylight” for natural gas. The evidence of a gas chimney includes (1) the component percentage of non-hydrocarbon gas, which decreased from the bottom to the top, (2) the pressure coefficient is normal because the gas reservoir from the Upper Sinian to the Lower Permian commonly have a normal pressure coefficient (an average of 1.0), and (3) the isotope geochemistry of the argon mostly represents abiogenic characteristics of a deep source, and the 40Ar/36Ar ratio is as high as 2 855–5 222 in the Upper Permian. All of these characteristics provide sufficient evidence for a gas chimney effect. The characteristics of low abundance in the Weiyuan Structure can be a reference example for studying the late reconstruction of deep oil and gas reservoirs in the superimposed basins of western China. 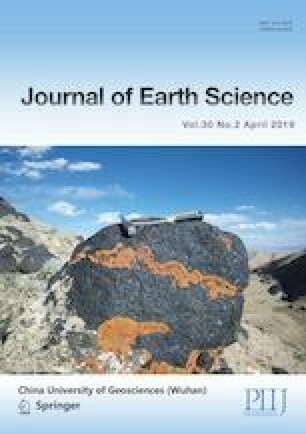 This study was financially supported by the Key Laboratory of Oil and Gas Reservoir Geology and Exploitation, Chengdu University of Technology, the 973 Program of China (No. 2012CB214805), the SINOPEC research project (No. P16109) and the National Science and Technology Major Project of China (No. 2017ZX05005003-007). The final publication is available at Springer via https://doi.org/10.1007/s12583-017-0962-y.